The final page count (which determines the width of the spine) and the trim size of the book are primary factors in the initial setup of the cover. Below is a simple diagram (based on an Amazon KDP template). LightningSource/IngramSpark templates are similar in appearance, but with a few cosmetic differences (blue guides instead of red for example). An interesting fact to keep in mind is that a KDP template and LS/IS template for the exact same book (trim size, page count, etc.) typically have a few differences that have to be accounted for in the design. So if you’d like to print with KDP and LightningSource/IngramSpark, please let us know so we can discuss formatting the layout for both and additional cost. 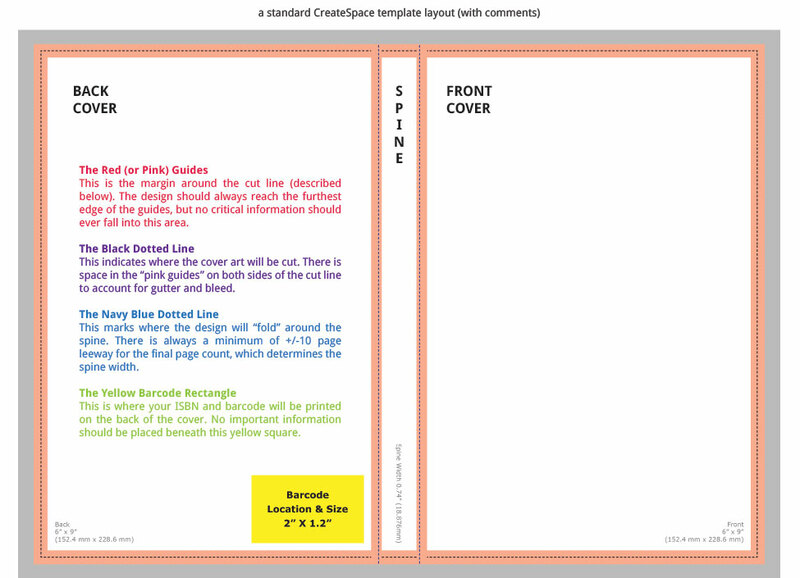 A standard KDP template layout, with added explanations. Want to learn more about print layouts? Visit our article on trim sizes here.